The United States Congress designated the Horseshoe Bay Wilderness (map) in 1987 and it now has a total of 3,842 acres. All of this wilderness is located in Michigan and is managed by the Forest Service. Horseshoe Bay dents a slight curve along the northwest shore of Lake Huron. Sandy beaches cover the southern third of the shoreline, which becomes rocky and marshy in the north. Hiking into the Wilderness, you'll find low ridges forested with balsam and cedar separating narrow, shallow swamps. Logging operations of the past have left behind abandoned roads and cedar stumps. Evidence indicates that Native Americans came here to fish the waters of Lake Huron long before loggers ever downed the cedars. Parcels of private land lie within the Wilderness borders. Wildlife species are those you would typically find in a wetland: beavers, otters, mink, muskrats, ducks, herons, and gulls. Eagles and ospreys nest in scattered white pines along the shoreline. White-tailed deer, black bears, coyotes, and snowshoe hares may be seen at times. Noise from the heavy traffic on nearby Interstate 75 resounds through the Wilderness. 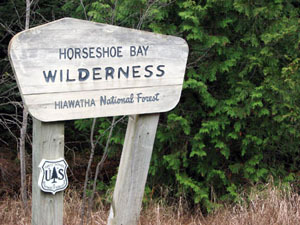 Planning to Visit the Horseshoe Bay Wilderness? How to follow the seven standard Leave No Trace principles differs in different parts of the country (desert vs. Rocky Mountains). Click on any of the principles listed below to learn more about how they apply in the Horseshoe Bay Wilderness.